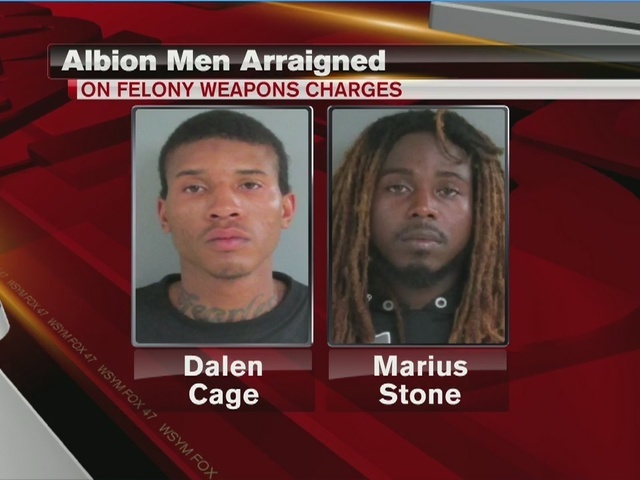 Two Albion men believed to be responsible for multiple recent shootings in the Albion and Jackson area have been charged and arraigned. 22-year-old Dalen Cage is charged with one count of carrying a concealed weapon. 26-year-old Marius Stone is charged with one count of possession of a firearm by a felon, possession of ammunition by a felony, carrying a concealed weapon and two counts of felony firearm. Police stopped a vehicle on Greenwood Avenue near Woodbridge Street around midnight on July 12. The vehicle matched a description of a vehicle used in several drive-by shootings. Officers recovered two stolen handguns inside the vehicle and took Cage and Stone into custody. Police say they are suspects in a shooting on High Street on July 12 and two shootings in Amberton Village in Parma in late June. Police do not believe the men were involved in the drive-by shooting on Summit Avenue on July 11 or the shooting at a gas station on Francis Street on July 12.